​We believe that every child in Myanmar (Burma) has the right to access quality education, no matter their circumstance. Launched in January of 2014, the myME project is a unique, non-formal education and outreach program that provides school and assistance to children who have been compelled into servitude, by bringing the classroom to them--directly where they work (and live). While we are not the first to use non-formal education, we are the first to bring it to child laborers. In Burma, according to 2014 census data, there are 5.09 million children between ages 5-18 who are out of school. ​Approximately 10,000 working and out-of-school children have benefited from myME, with an average of 87% attendance rate, since the project's inception. 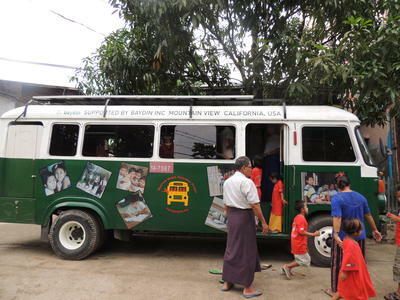 For many families in Myanmar, sending children to work is an undesired necessity. We started the pilot run with 60 kids in 2 teashops in early 2014. ​Less than four years later, in 2018, myME has already expanded to serve more than 3,000 students annually from various teashops, road-side restaurants, monastic schools, and underprivileged communities in Yangon, Mandalay, Mawlamying, Myingyan, Kyauk-Se, Dala, East Dagon, and Hlaing Thar Yar townships with over 60 staff and 5 mobile classroom buses. Teashops in Myanmar are often "manned" by children who have no opportunity to go to school. Congratulations to Level 1 and Beginner Level myME students! On December 7, 2018 37 of our myME students graduated their respective levels. We had 20 students receiving their beginner level certificates, and 17 students receiving their Level 1 Certificates. It was a wonderful day full of songs, food and laughter. Though a very joyful event, some of the students did not eat the food, saving it for their families. A reminder to all present, that these young workers always have people back home in their villages, depending on them for their basic survival. Hnin Nadi Winn is one of our exemplary students of the month. ​Hnin Nadi Winn is 15 and the eldest of 4 siblings. Several years ago her parents pulled her out of school so that she could start working to support the family. Today she she works from 7 am until 5--when she is allowed to attend the myme classes. Her favorite subject is Life Skills training because as she says, "It shows me how to overcome many problems." Click on Student of the Month video to learn more. 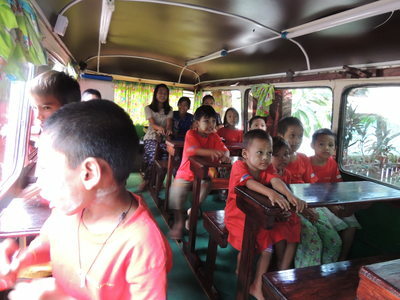 When the myME buses are not being used for our regular classes, we schedule days in which we invite children from the most underserved communities to climb into our mobile classroom for a full day of educational activities with our teachers, staff and volunteers. To date, we have served children in the poorest communities of Yangon, Mandalay, MyinChan, KyaukSe, MawLaMying, Dala, HlaingTharYar, and East Dagon.